 T. Everett Marche (Railway Mail Service); Thomas B. Marche (clerk, Post Office Department). Thomas E. Marche (clerk); Thomas B. Marche (clerk, Post Office Department). Thomas B. Marche (clerk, Post Office Department); Maud Waines (servant). Thomas B. 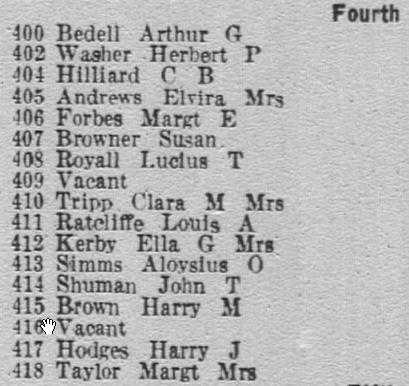 Marche (clerk, Post Office Department); Maude Waynes [sic] (domestic). T. Everett Marche (postal clerk); Thomas B. Marche (clerk, Post Office Department). T. Everett March (clerk); Thomas B. Marche (clerk, Post Office Department). T. Everett Marche (clerk); Thomas B. 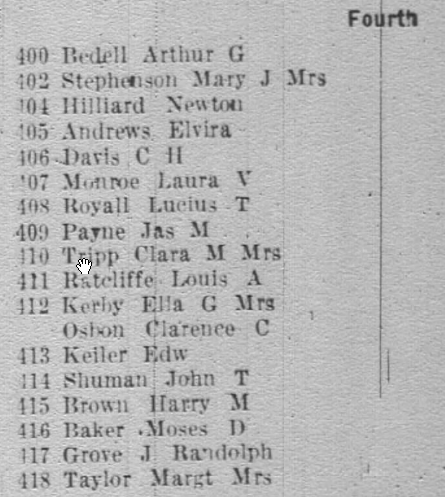 Marche (clerk, Post Office Department); Hattie Taylor (domestic). Thomas B. Marche (chief clerk, division, Post Office Department). Everett T. Marche (clerk); Thomas B. Marche (clerk, Post Office Department). Everett Marsh [sic] (postal clerk). T. Everett Marche (clerk); T. Everett Marche (clerk). Thomas E. Marche (Railway Mail Service). Margaret B. 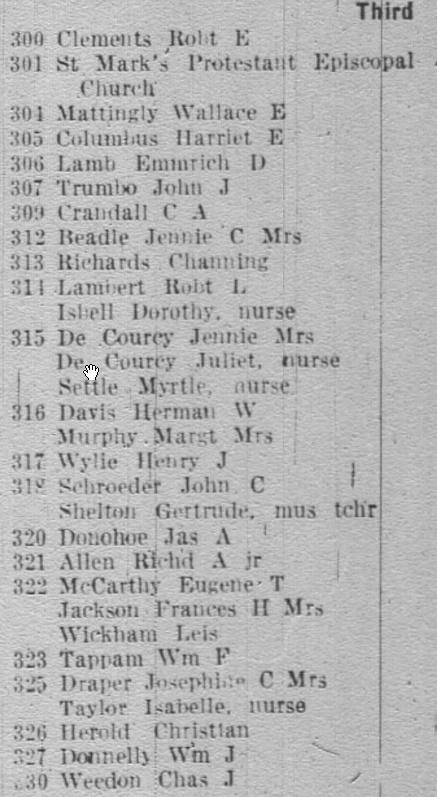 Fields (nurse); Alice I. Marche (stenographer). Alice I. Marche (clerk); Thomas E. Marche (Railway Mail Service). Alice I. 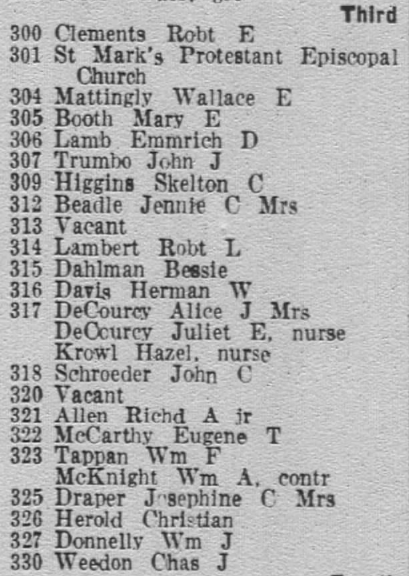 Marche (stenographer); Thomas E. Marche (clerk); Maggie Smith (domestic). Robert L. Lambert (Bureau of Printing). Susie Lambert; Annie M. Shirley (Bureau of Printing). Robert L. Lambert (Lambert & Henderson). Otto Keeler (conductor); John A. Petz (clerk). William S. Campbell (clerk, Department of Agriculture); Walter N. Gates (fireman). Walter N. Gates (fireman); William S. Campbell (clerk, Department of Agriculture). Lucian Wharton (clerk); Rhett Wharton (clerk); Wallace Wharton (clerk). Bertha F. Thomas (War risk); W. W. White. 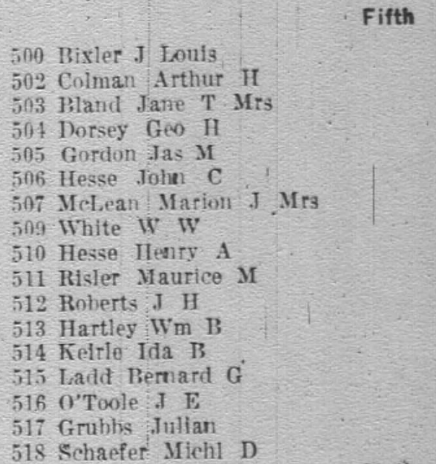 Mrs. Alice R. Marche; Harsen L. Richards. Harsen L. Richards (piano tuner). 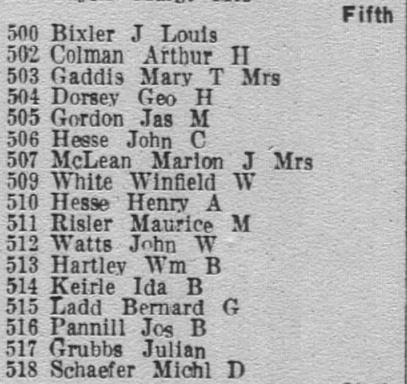 Federal census, 1920, 509 A St., S.E., Washington, D.C.
William W. White, rents, 27, b. in Md., father b. in Md., mother b. in D.C., salesman, auto lubricants. Marie White, wife, 22, b. in Md., parents b. in Md. Margaret White, daughter 3-1/2, b. in D.C., parents b. in Md.